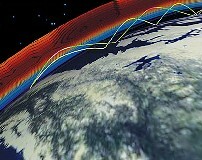 ARCS 3D-modeling of the ionosphere. Professor Bob Brown, NM7M, worked as Physicist at University of California at Berkeley, as expert of the upper atmosphere and the geomagnetosphere. Until 2004, he was very interested in propagation, and worked mainly on the top band of 160-meters. Bob Brown passed away on May 23, 2010. He was 87. In 1998, Bob Brown wrote a syllabus about HF propagation for his students that will become this tutorial in which Bob introduces us in the fascinating world of HF propagation. It is at that time that I asked him the permission to publish his syllabus on this site. To provide an accurate information to the reader, I took the freedom to add illustrations and additional comments (referenced in notes) as some information changed over the years (e.g. an URL); new documents (studies, bulletin, models, images, etc) have been released and are today available on the Internet as well as new propagation prediction programs, as many information that, I hope, will complete the already very useful information provided by the author. These updates were made in 2004 and links as well as the list of software were updated in 2014. I hope that this document will become one of your bedside book. Ready? Hop!, let's jump in the upper atmosphere in company with Bob. I have to agree there is a lot of information out there on the Internet; but what about understanding? Let me put out a few remarks that might help your understanding of propagation. First, we depend on ionization of the upper atmosphere. That results from solar ultraviolet, "soft X-rays", "hard X-rays", and the influx of charged particles. Leaving the charged particles out of the discussion today, the solar photons have their origin largely in active regions on the sun. Historically, active regions were first counted and tallied, then the next step was to measure their areas. Both methods have their problems with weather conditions and after WW-II it was found that the slowly-varying component of solar radio noise at 10.7 cm was statistically correlated with the method using sunspot counts. Later, with the Space Age, it was found possible to measure the "hard X-ray" flux coming from the sun in the 1-8 Angstrom range. In my opinion, the 1-8 Angstrom background X-ray flux is a better measure of solar activity, at least for our radio purposes. Let me explain. First, the X-ray flux has been found to come from regions more centrally located on the visible hemisphere of the sun; that means a significant fraction of their X-rays will reach our atmosphere. Second, it takes 10 electron-Volts (eV) of energy to ionize any constituent in the atmosphere; the energy of 1-8 A X-ray photons exceeds that by over a factor of 100. The energy of 10.7 cm photons is .00001 eV, a factor of 1,000,000 too LOW to ionize anything in our atmosphere. So the 10.7 cm flux only tells us about the presence of active regions on the sun, not directly about the state of ionization in the ionosphere. If that was not bad enough, it has been found that the 10.7 cm flux can come from the corona above regions which are behind the east and west limbs of the sun. Those regions are much less likely to have their ionizing radiation reach the ionosphere directly. So the 10.7 cm flux has its purpose, indicating the presence of active regions, and it is a mistake to think that changes in that flux are always associated directly with the state of our ionosphere. However, as noted LX4SKY who provided the next plots, the solar flux at 10.7 cm is not without effects on the temperature and pressure of the high atmosphere of the Earth as show well the documents display below. This effect will mainly impact the lowest band propagation. Correlation between the solar flux at 10.7 cm and the variation of the earth atmospheric pressure. At left the solar cycle forcing (K per 100 units of 10.7 radio flux). On the right image, at left correlations between the 10.7 cm solar flux (the 11-year solar cycle) and 30-hPa heights in February, shaded for emphasis where the correlations are above 0.5; upper panel: years in the east phase of the QBO (the phase of the Quasi-Biennial Oscillation determined using the wind between 50- and 40-hPa in January and February); lower panel: years in the west phase of the QBO. At right, respectively, height differences (geopot. m) between solar maxima and minima (1958-2001). Documents Met Office and K.Labitzke, FUB. Having said all that, let me conclude by pointing out the 1-8 A X-ray flux values are given by NOAA in ranges which differ by a factors of 10, such as A 2.3, B 4.0 or C 1.5. The numbers are the multipliers and the letters give the category. Now I have logged the 1-8 A X-ray flux through all of Cycle 22 and now into Cycle 23. The sum and substance of my experience is quite simple: the A-range is found around solar minimum, the B-range on the rising and falling parts of a cycle and the C-range during the peak of a cycle. So what about Cycle 23 than will probably extend from 1997 to 2007? We suddenly moved out of the A-range (with sporadic B-outbursts) in August of '97, hovered in the low B-range until March '98, were in the mid-B range to the present time when there were recent outbursts in the C-range. It is still too early to say if solar activity has moved into the C- or solar maximum phase; several months of data will be needed before any such estimate can be made. At left the solar cycle 19 to 23 (from 1953-2005). At right the solar flux at 10.7 cm from 1947 to 2001. Documents SIDC and SPIDR. But logging the 1-8 A X-ray flux, with 4-cycle log paper, will give you insights as to the state of the ionosphere and recurrences in the plot will serve to point out good/bad times for DXing. While spikes in the 1-8 A diagram may suggest "hot times" for DXing, they can be brief and difficult to take advantage of. It is more productive to look at the broader peaks in flux in planning one's DXing. The flares and coronal mass ejections associated with outbursts of activity that take place now are more likely to give bad propagation conditions because of all the geomagnetic activity that follows. For DXing, the broad peaks are more productive. When it comes to changes in the state of the ionosphere, X-rays are to solar noise as, with DXing, beam antennas are to dipoles. OK? Having talked about the creation of ionization overhead, electrons and positive ions, all sorts of practical questions come up at once. And some theoretical ones too. We'll leave the theory to a later time, when DXing is slack and there is more time to spare. But when it comes to practical matters, we have to throw our frequency spectrum against the ionosphere and see how it all shakes out. Of course, all that was done more than 50 years ago, one frequency at a time, and the idea of critical frequencies emerged. Those were for signals going vertically upward into the various regions overhead, foE and foF2 for E- and F2-regions, and gave the heights and frequency limits beyond which signals kept on going into the next region or on to Infinity. But we communicate by sending signals obliquely toward the horizon and that makes a difference, our higher frequencies penetrating more than the lower ones before being returned toward ground. And we have to note our RF excites the electrons in the ionosphere, jiggling them at the wave frequency, but they do collide with nearby atoms and molecules, transferring some energy derived from the waves to the atmosphere. 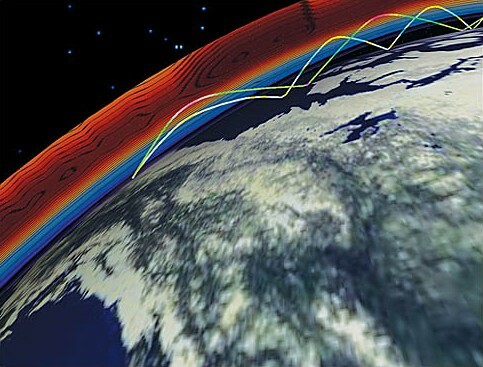 That's how signals are absorbed, heating the atmosphere. But for electrons, there's a difference between being excited by 28 MHz RF and 1.8 MHz RF. For one thing, it depends on how often electrons bump into nearby atoms and molecules. At those high frequencies, say 28 MHz, the wave frequency is high compared to the collision frequency of electrons and absorption losses are relatively small. The same cannot be said for 1.8 MHz signals on the 160 meter band and the wave and collision frequencies are comparable, meaning that electrons take up RF energy and promptly deliver it over to the atmosphere. One can go through all the mathematics but you can almost guess the answer: absorption is a limiting factor for the low bands, 160, 80 and 40 meters, and ionization or critical frequencies (MUFs) are the limiting factors for the high bands, 15, 12 and 10 meters. That makes the middle or transition bands, 30, 20 and 18 meters, ones where both absorption and ionization are important. We can phrase this in another practical way - 160 meter operators do all their DXing in the dark of night when there's no solar UV or X-rays to create all those electrons that absorb RF. By the same token, the 10 meter crowd do their DXing in broad daylight, when entire paths are illuminated, and they couldn't care less. Those are the extremes but practicioneers on the "workhorse band", 20 meters, have to put up with both uncertainties in MUFs and the absorption by electrons. But in times like now, there is enough ionization up there to support DXing at dawn and dusk, when the absorption is at a minimum. For that band, Rudyard Kipling's ideas about "mad dogs and Englishmen go out in the noon day sun" would seem to apply. OK? A typical spaceweather report available online via the "DX ToolBox" software. Those ideas, darkness and sunlight on paths, bring up the matter of computing with mapping programs for checking darkness on 160 meter paths and daylight on 10 meter paths as well as MUF programs for bands from 10 MHz upward. But those last programs should also have a capability of giving signal/noise ratios for the bandwidths appropriate for the modes. After all, getting a signal from a DX location is not worth much if it cannot be read above the noise. For me, VOACAP is at the top of the list but it has offspring and there are other programs that can fill the bill. But I cannot stress mapping programs enough; you just have to see where you're trying to go and the obstacles along the way, like the auroral zones. 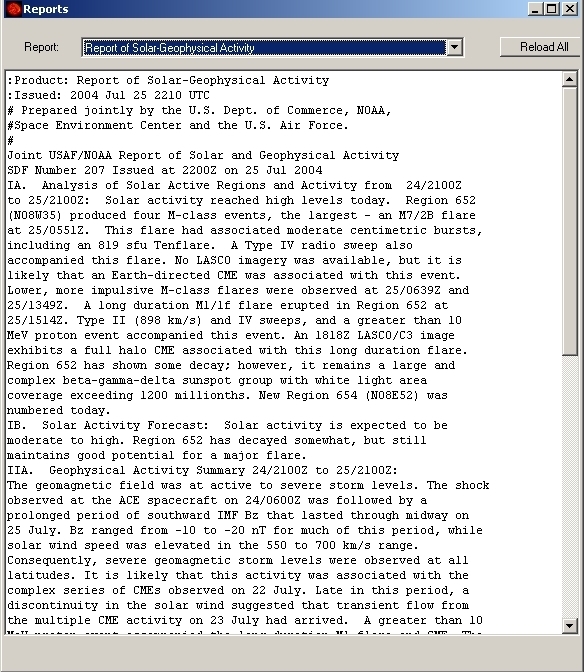 But to use a MUF program, a measure of the current solar activity is needed and effective sunspot numbers (Effective SSN) were for a while available in "HF Prop" bulletins from the Air Force and the Space Environment Center of NOAA (SEC). Those numbers were derived from observations of actual propagation and amount to "pseudo-sunspot numbers". They were more to the point than using daily values of the 10.7 cm solar flux. However today only Part IV of this bulletin is still available via the Internet. Other products like IonoProbe from VE3NEA also provides the Effective SSN and other real-time solar data. Note by LX4SKY. The U.S. Air Force no longer produces the "HF Prop" Bulletin. They stopped this some years ago. However, the data in section Part IV of the old bulletin can be found on SEC website at a couple places. For example, under ONLINE DATA click on "Near Earth". "Near Earth Alerts and Forecasts" have the daily Solar and Geophysical Activity Report and 3-day Forecast. This product contains the Observed/Forecast 10.7 cm flux and K/Ap. Under the "Near-Earth Reports and Summaries", the Solar and Geophysical Activity Summary contains the Satellite Background and Sunspot Number (SSN) in section E and daily Indices (real-time preliminary/estimated values). Today VOACAP is available online. At last, recall that in a propagation program like DX ToolBox, some of these reports can be read from within the application (if you have an active connection to Internet of course).